Lloyd's Underwriters is fighting a default judgment ordering the insurer to pay an Abbotsford, B.C., treasure hunter for the loss of a diamond-encrusted golden eagle reportedly stolen in a brazen mugging. Ron Shore claimed the diamond-encrusted golden eagle was stolen in May 2016 by two men who lay in wait as he opened the trunk of his car. Lloyd's Underwriters is fighting an order to pay insurance. Lloyd's Underwriters is fighting a default judgment ordering the insurer to pay an Abbotsford, B.C., treasure hunter for the loss of a diamond-encrusted golden eagle stolen in a brazen mugging. Last month, a B.C. 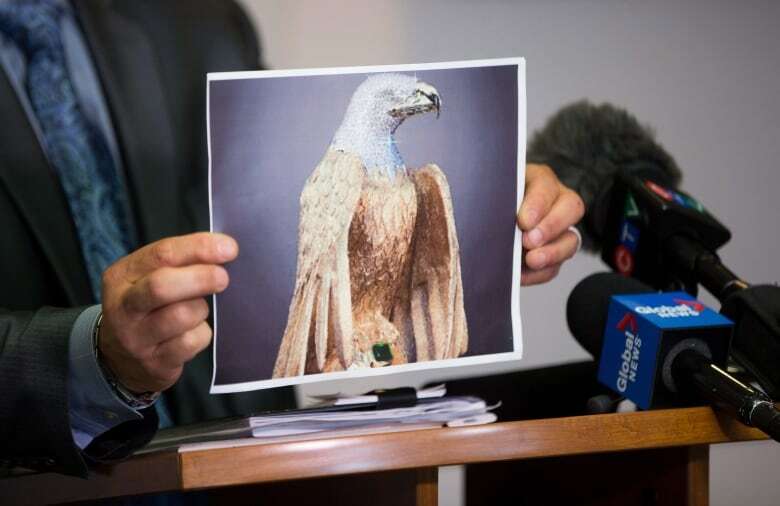 Supreme Court registrar ordered Lloyd's to honour a claim from Ron Shore's company — Forgotten Treasures International — for the golden eagle, which was allegedly stolen along with a silver decoy in May 2016. But according to court documents, the insurer will seek to set aside the order next month. Lloyd's says the company still plans to "mount a vigorous defence" in the case — claiming Shore failed to ensure two people accompanied the fancy fowls as required. 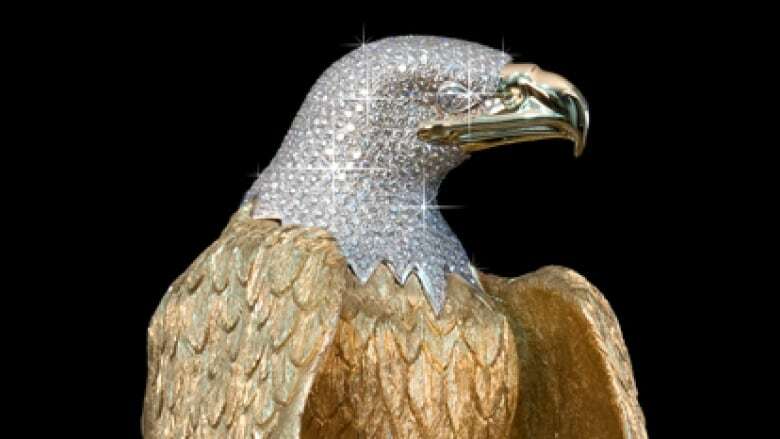 Shore garnered international headlines after the theft of the eagle — an eight-kilogram statue encrusted with 763 diamonds. The glittering bird was the focal point of a global treasure hunt rewarding contestants with silver eagles for finding hidden certificates through clues contained in books sold by Shore. The grand prize was $1 million. According to court documents, Shore intended to auction the golden eagle at the end of the contest to finance the final prize. Any leftover cash would go to breast cancer research. 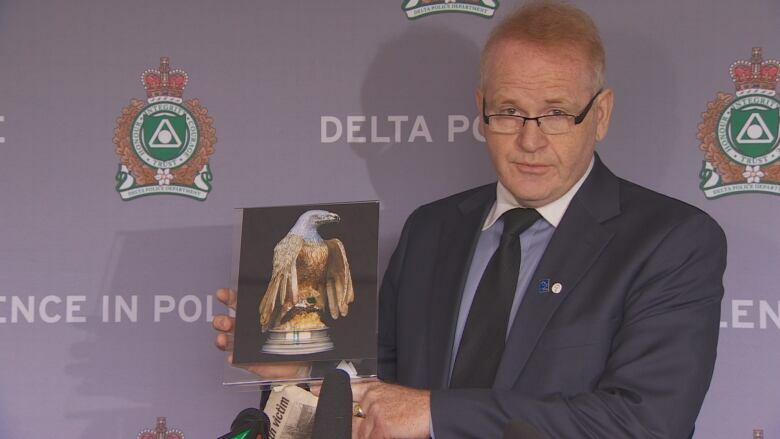 Shore told reporters the stolen eagle was worth at least $5 million. But the initial notice of civil claim said the bird was appraised at $930,450. According to Lloyd's, the insurance policy required two people to accompany the eagle at all times other than when deposited in a bank safe or vault. The only exception was if one of the people had to go to the bathroom. The insurer's court filings include a statement from Tanya Merx, a Burnaby psychologist — and friend of Shore's — who said she accompanied Shore to a Ladner church on the night the thieves lay in wait. He was at the church to promote the treasure hunt, according to court documents. Ladner is 27 kilometres south of Vancouver. "I'm not technically a security guard, I'm a psychologist for a living, but for that night — like, I don't know what the terms are, security guard, like I find that a bit confusing — but I was the second person with him," Merx told a Lloyd's claims adjuster. "He had his two backpacks with the eagles within them when he came into the church and he texted. I actually texted him and I said, 'I'm in the front, second row left.'" According to the statement, Merx claimed Shore wasn't "showing the eagles around or anything" during the event at the church. She said someone asked him about the eagles, and he said: "As a matter of fact, I have them right here." Merx claimed she said to Ron: "'You shouldn't say that, we don't want something to happen', right, because that was kind of unlike Ron to even say that, because he's very discreet. "He didn't take the eagles out of the backpack or anything or show them around, he actually showed ... a picture on his phone." She claimed Shore walked her to her car at the end of the night before going to his own vehicle, parked six to eight metres away. According to the lawsuit, Shore was attacked and hit over the head after opening his trunk: "the thieves cut the strip of the backpack in which the eagles were concealed and ran away with the eagles." Merx told the adjuster she learned Shore had been mugged when he called her 15 minutes later. "So I didn't actually witness it happening," Merx said. "I think they were watching us the whole time and then the minute I drove away, I don't know, it just happened like right then, it sounds like. How many minutes, I don't know, 30 seconds or a minute?" Shore's original B.C. Supreme Court claim accused the adjuster of being "abrasive and combative" and "treating the denial of coverage as a foregone conclusion." 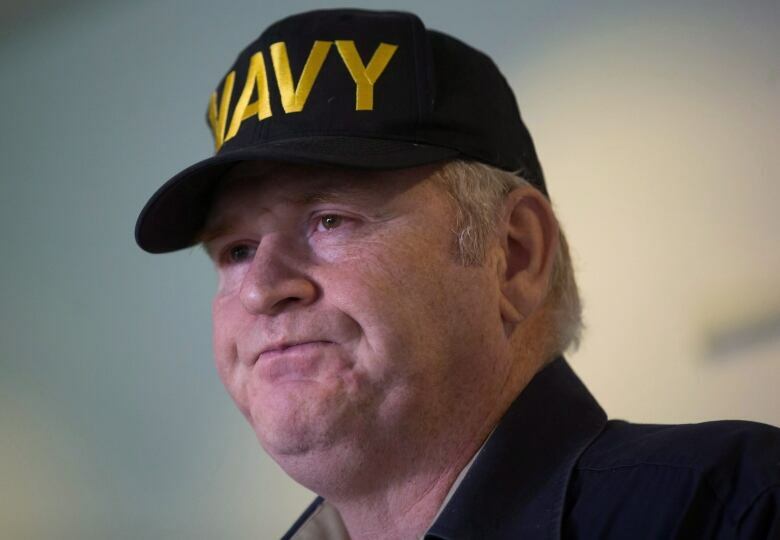 In the application to set aside the default judgment, Lloyd's lawyer Arnold Schwisberg claims Shore's lawyer refused to provide "particulars" about the claim needed to file a full response. He claims the lawyer then sought and obtained a judgment despite repeated requests "that he confirm that no default proceedings had been taken." The default judgment orders Lloyd's to pay Shore's company "in an amount to be assessed." The policy limits coverage for the golden eagle to $710,000 and the silver eagle to $53,750. Lloyd's wants the judgment set aside as well as 30 days to file a response to the civil claim. Although Shore claimed Merx was his designated security person, the insurer claims "she was not security personnel, but was just a friend of Mr. Shore's." 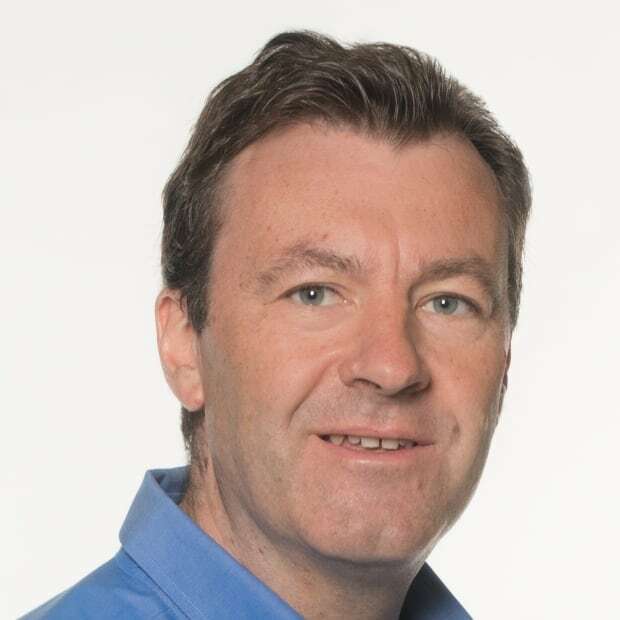 "It is also clear from Ms. Merx's statement that she was not with Mr. Shore during the reported mugging; rather she had driven away from the scene and did not see the theft," Schwisberg states. "Therefore, two persons for the plaintiff were not accompanying the insured articles at all times, as required." Shore is also suing the Insurance Corporation of B.C. and the unknown driver who he claims he pursued into a "black or dark grey/blue GMC Yukon or Cadillac Escalade" after he was assaulted outside the church. Shore claims the driver "put the window up and trapped [Shore's] arm in the window." "[He] drove off and the plaintiff was dragged backward for approximately 200 metres before the [the driver] lowered the window and [Shore] dropped to the ground," the claim reads. Shore says he suffered a concussion and torn meniscus as well as other tears and "extensive bruising and road rash." He claims he is unable to continue his occupation or employment and continues to suffer a loss of earnings. ICBC has yet to reply to the claim.